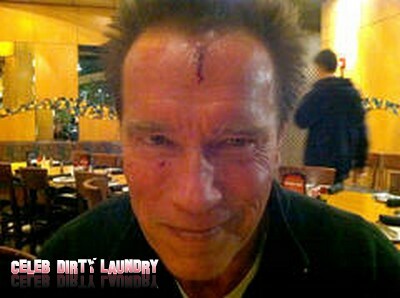 Arnold Schwarzenegger looked like he made his last stand – and lost – after he was injured on the set of his new film. The 64-year-old action former Mr. Olympia had to receive prompt medical attention for a deep gash to his forehead forcing filming to be suspended his new movie, ‘The Last Stand’ yesterday while he was treated. Schwarzenegger – who did not reveal any details of how the accident happened – has been shooting the movie in Albuquerque, New Mexico, and in it he plays a small town sheriff who takes on a drug kingpin. The Hollywood star returned to acting after leaving office as the Governor of California in January. Since filming started on ‘The Last Stand’, Schwarzenegger has been keeping his fans updated on his time Albuquerque with regular twitter updates. Wonder if Maria Shriver was on the set… . Is This A Bad Hangover? Kristen Stewart Back On ‘Snow White and the Huntsman Set’ – New Pictures!